Dyeing hair is a common, but not recent, beauty practice. Hair dyeing (coloring) has been around for thousands of years, using plant-based dyes such as indigo and turmeric before synthetic dyes were invented. I recently wondered “What kind of science goes into modern hair coloring? What is the process?” I have had my hair colored before but never even wondered how the coloring occurs. I reached out to my very good friend and cosmetologist, Erin Rausch, and asked her to explain the process. Like most working professionals, cosmetologists attend school before they begin working with actual clients. While each school has a different curriculum, Erin attended Aveda Institute in Madison, where she spent six months in a classroom learning about anatomy, chemistry, color theory, and the study of the hair and scalp – trichology. In cosmetology, it is exceedingly important to understand the biology of hair, particularly in the case of hair coloring. Like the skin, hair has pores and layers. The hair layers open with heat and close with cold, kind of like when you open an umbrella when it’s sunny and close it when it’s dark. A good cosmetologist understands how chemicals affect and interact with the hair, studies the existing melanin (pigment) of the hair to later replace it with new color. Also, like skin, hair contains different kinds of melanin, and different melanins result in different hair colors: pheomelanin results in hair with a pink to red hue (pheomelanin is also in lips), and eumelanin results in the darkness of the hair: more eumelanin – darker hair, less – lighter hair. 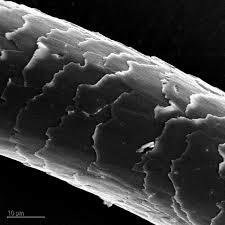 Microscopic image of human hair. Hair has layers, like skin, onions, and Shrek. 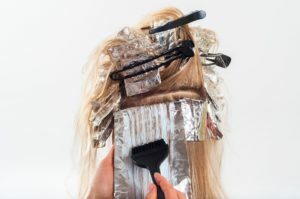 Cosmetologists need to consider every aspect of the customers’ hair before continuing to color. 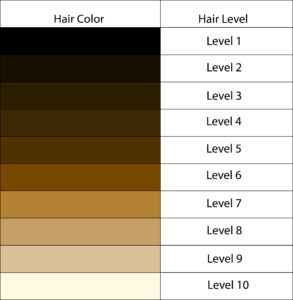 First, hair color is sorted into color levels, 1-10; 1 being black, 10 being whitest blonde. Aside from natural hair color, it is important to consider the type (thickness of the hair strand), texture (straight or wavy), density (number of strands of hair per square inch) of the hair, whether the hair has had previous treatment, and the distance from the scalp that you’re treating. The scalp produces heat which causes the color to react a little differently near the scalp than hair away from the scalp. For this reason, it is important to consider the density of the hair. A higher density of hair results in more heat near the scalp, changing how color will interact with the hair near the scalp compared to hair away from the scalp. Hair levels determined by hair color. Once all of the variables of the clients’ hair have been evaluated, cosmetologists then formulate how to color. There are several steps in the hair coloring process. First, they always formulate according to the existing natural level of hair color (levels 1-10). Dyeing hair is essentially a melanin exchange where natural melanin is exchanged with a different, synthetic one. Removing natural melanin is done with ammonia or bleach, partnered with peroxide; causing a chemical reaction. There are different strengths of peroxide, and the one used depends on type, texture, density, and final desired hair color. It’s extremely important to be careful with peroxide strength, as certain volumes can cause chemical burns and adverse chemical reactions. A common analogy is the peroxide is like the length of time or heat used to cook spaghetti. If you don’t have enough, your spaghetti isn’t cooked, but if you have too much, your spaghetti is overdone. Too much peroxide will severely damage your hair, like overcooking pasta. Depending on the natural hair color or previous hair treatment, it might take more than one peroxide treatment step to remove melanin. Color Theory. To neutralize Natural Remaining Pigment, the complimentary color is used. For example, Level 10 hair (lightest blonde) has yellow natural remaining pigment, so violet would neutralize the NRP. After the peroxide treatment, there is still pigment remaining in the hair, called Natural Remaining Pigment (NRP). It is important to neutralize the NRP, so it doesn’t affect the future desired hair color. NRP is neutralized by adding the opposite/complementary color. If Erin wanted to neutralize level 10 (lightest blonde), she needs to use violet. 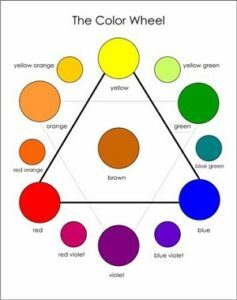 All of the variables are part of color theory and the treatment depends on look you want to create (I should have paid more attention in art class). A client’s hair is sectioned as color(dye) is being applied. Once the natural melanin has been removed and the NRP has been neutralized, it’s time to color the hair! The amount of hair color product needed to color the hair depends on hair type and desired color(s). The bigger the hair section (as can be seen in the image above), the less the color will permeate the hair strands evenly. Thus, more hair product will be needed so the hair will be properly colored, and the color will last a long time. Erin strongly recommends against at home hair dye kits. While they may seem cost effective, their methods for hair coloring can be damaging to your hair. These kits are made to achieve one color and are only designed for people that have no color on their natural hair. Since people have many different kinds of hair and hair color, there is a large chance the at home dye color you pick will be very different from what you want. The peroxide used in the kit is also a very strong peroxide (much stronger than peroxide used in salons) and because the peroxide in the kit is so strong, the color is much harder to remove or correct later on. Essentially, at home hair dye kits are very damaging to hair. To see Erin’s portfolio, check out her instagram!